Home » Awards » Too Much Of A Good Thing? Six more awards and another significant milestone! The Urge To Wander – a moment ago – logged 10,000 hits! Needless to say, I am surprised, overwhelmed, grateful and flattered beyond words! Thank you Naomi (She had me from Hello 🙂 I clicked follow after reading her beautifully written first post!) for nominating me for the ‘7 x 7’ award and for your wholehearted appreciation of my work! Thank you Tania (I meant it when I said she was GOOD! Rush before this girl starts charging for her autographs 🙂) for nominating me for the ‘Blog On Fire’ award! Means a lot coming from you! Thank you Orples (Might not be long before you have to wait for autographs from this wonderful children’s author/illustrator either!) for nominating me for the ‘Genuine Blogger’ award and for your constant support! Thank you Memyselfandela (A fledgling blog that is a delightful cornucopia of photographs, videos, poetry, et al!) 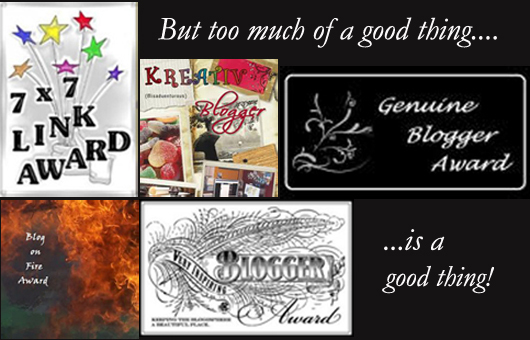 for nominating me for the ‘Kreative Blogger’ award! Truly appreciate your gesture! Anne Onsoien (An AMAZINGLY creative designer/illustrator following her dreams and inspiring others to do the same through her wonderful blog!) for nominating me for the ‘Very Inspiring Blogger award! Touched and honoured that you consider me deserving! And finally many thanks to Meg (Whose beautifully scripted travelogues transport you to exotic destinations!) for – just a little while ago – nominating me for 2 more – the Sunshine blogger & another Genuine blogger awards!!! Grateful & overwhelmed! But….with due apologies to the Bard (and Mae West! ), I also believe, that too much of a good thing can be distracting! I have been so terribly busy the past couple of weeks that I have been reneging on my posting schedule! So with your permission, I humbly request to be exempted from the rules of the game! Instead, I shall update my blog roll in the coming week (or so)! But do know, whether you are on that list or not, that I truly think ALL the blogs I follow, ROCK! You don’t need any nominations to validate that! Way to go Madhu…….we love your history lessons and stories. Keep them coming. Congratulations Madhu, you deserve them all! I love your history lessons, Madhu! They never get me bored. Appreciate that Bama! Thank you so much! Congrats Madhu! With awards and the great numbers. It’s truly well deserved. Thank you so much for the kind words Orples! Keep writing Madhu – you know I love your detailed history lessons! Love yours too James! Thank YOU for the encouragement! Hi Madhu! It doesn’t rain, but it pours. That is because you deserve the recognition. It does…..just received another one 🙂 Thank you guys! I am truly overwhelmed! Congrats on getting so many awards. Your blog deserves them for sure. Congratulations hon and don’t get happy too soon because I am in the process of nominating you for the “Versatile Blogger Award” as well…hehehe. You have a great blog and deserve all of these awards. You will have a to make a new page with all your awards as well soon. LOL! Grateful for the thumbs up Sonel! So much blog love!! Delighted and honoured, again 🙂 Thank you Sonel! congratulations madhu, your blog is a treasure deserving recognition! I love your blog! Keep up the urge to wander! And we will follow! Congratulations! The awards are well deserved. Thank you for saying that! Means a lot! Thank you! Shall try my best to do something about it 🙂 As you can see, I am desperately tying to catch up with my comments and blog reading! Hearty Congrats Madhu – very well deserved. Thank you so much Kavi! C O N G R A T U L A T I O N S Madhu! I have so much to learn from your mesmerizing photos and intriguing stories!